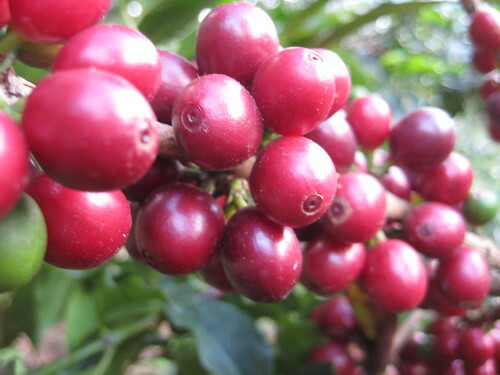 Harvest is a season and everyone seems to have a different point of view about exactly when this begins as the cycle of growing coffee is exactly that… a cycle. Although we did start some picking in early January, this year the first day of harvest for us is January 21. PEPENA is the word in spanish we use for the pre picking which we do to capture early ripes. This also prepares the tree for a more uniform harvesting and allows maximum nutrient to be available to the fruit that is prepared for export. It is costly to have a separate PRE harvest picking wave, but the cup quality proves this to be well worth it. Traditionally it is common practice to catch the over ripes during the first wave of picking and for quality’s sake sort them out somehow at some point. However the fruit that is reaching “IT’S POINT” ends up competing for nutrient with the fermenting dying coffee that is ahead of the game and now dying on the tree. We’ve tried to send out a “STATE OF THE HARVEST” newsletter each year to our customers in the past. Instead I’ve thought more about creating a TOP 10 list of reasons why NOT to write it. Of course it would include the fact that we have few customers, no one reads it and if I’m not procrastinating and I get around to writing – my writing gets wordy. The truth is it is hard to write a years happenings concisely and you should just come down and see for yourself. To answer the most common question “How’s the harvest looking?”. It’s looking great. Quantity will be less this year and much less for many of our neighbors. Not so much because of one time weather related events.. rather a cycle of having relatively strong production the last couple years. This is a year that the mountains are taking a breather. (small tip for those working of the C) I will try to post more “happenings at FVH” in the coming weeks. On that note- a few weeks ago we (Guatemala) lost aproximately 150,000 bags or 20 Million dollars worth of coffee due to high wind. Click here for more info (in Spanish). It was previously expected that the 08 crop would exceed the 07 crop in quantity. No longer the case.